Celebrating Fall is a fun way to add color and sparkle to life. A hand-stamped card with a pretty textured embossed background and dynamic die-cut leaves, pretty paper and glimmer is bound to warm someone's day. Join us in creating and sending pretty hand-crafted cards into the lives of your family or friends. I love the colors and textures of Fall! 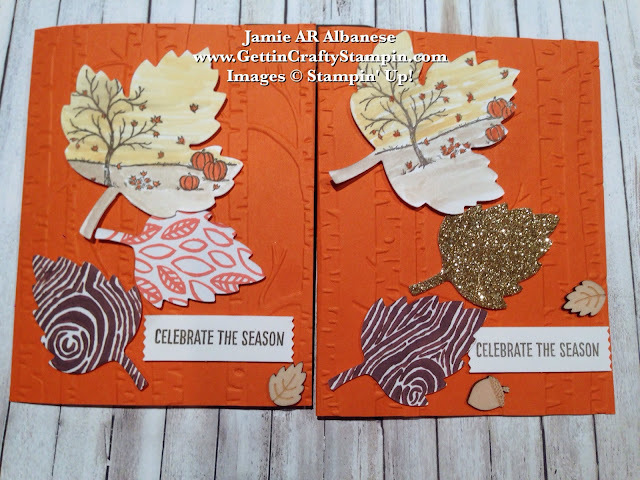 This card, from our recent Stamper's 10 Club, is a perfect use of the Happy Scenes stamp set in a new way while embracing Fall. Create a pretty water colored look. 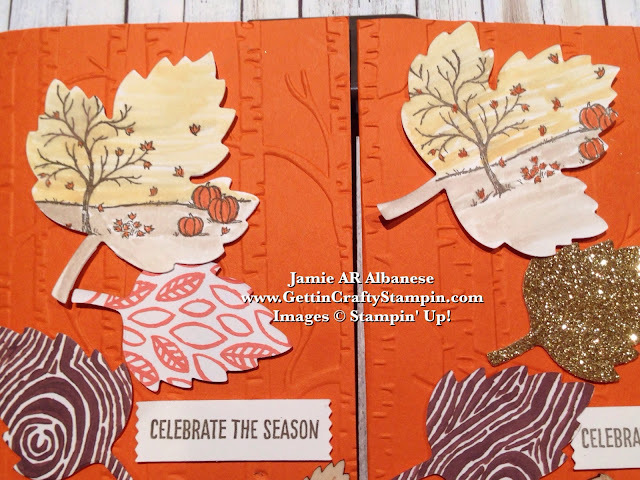 Stamping the Happy Scenes fall image on Whisper White card stock with Soft Suede ink. Using the Aqua Painter color, carefully, as the Soft Suede ink will blend into the Crumb Cake and So Saffron as you paint it. I really wanted the leaves and pumpkins to POP! Using the Tangelo Twist Stampin' Write Marker (from the 2014-16 In Color collection) and color at the end for the more intense color. Die Cut leaves.. is so much fun! 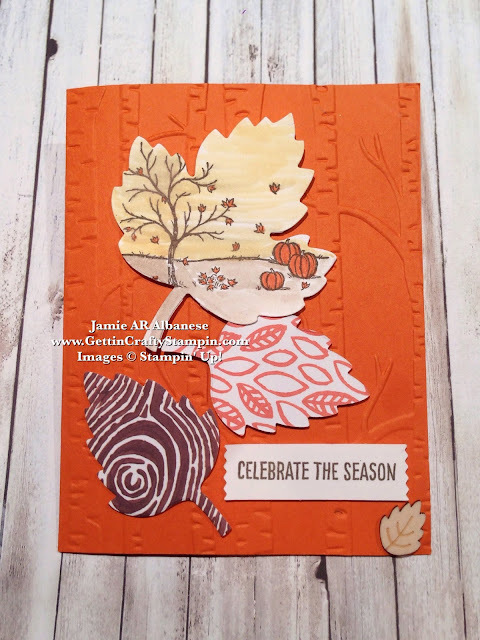 A twist on the Happy Scenes and adding the pretty paper of the Into the Woods Designer Series Paper. Cascading leaves are perfect for Fall. I love that this coordinates so well with this new Woodland Embossing Folder. I adore the new Holiday Catalog! My Big Shot Die-Cutting Machine does so much - from embossing to die-cutting for a more dynamic hand-crafted card. I adore our Designer Series Paper that is doubly beautiful with coordinating images on each side of the pretty paper. Take it up a notch. Adding a dash of sparkle with our Gold Glimmer Paper is a fun accent for Fall. The Wooden Elements* accents are so much fun! The *picture above shows how fun and easy it is to color them in and change the look of them and your hand-crafted card. Water colored and die-cut this rubber stamped image and the pretty paper really make for an easy but cool look. Accented with this Celebrate the Season sentiment punched using the Washi Label punch - perfect for so many greetings on your paper crafting. 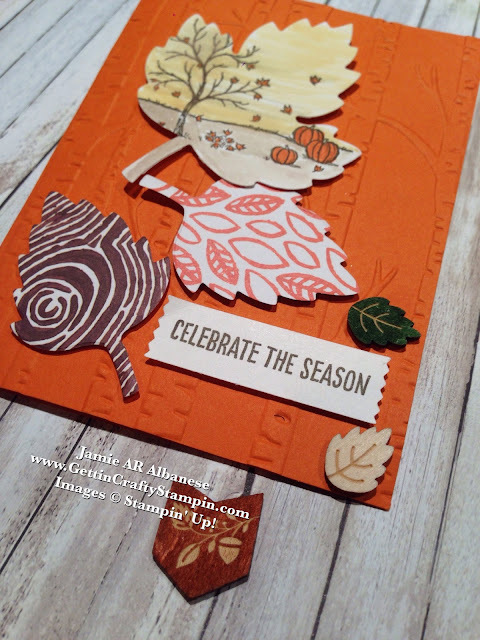 Created at a recent card making class, this Fall card is perfect to deliver a bit of the pretty season to those you love. With pretty paper, cool texture and fun die-cuts this water colored card delivers so much in one pretty folded piece of card stock. I love looking at stamps and die-cuts (or punches) in a new way. Here the Happy Scenes is designed for the Window Framelits but looks amazing with this twist on this combination. 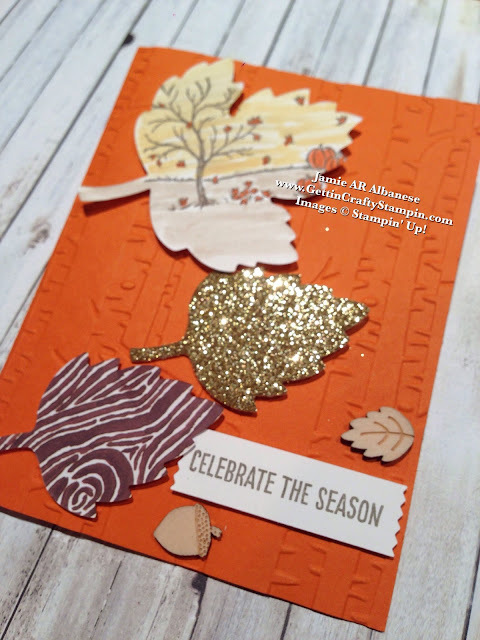 Happy Fall Stamping!